We're all off now, but at 23:20 GMT we'll have a 20-minute highlights show for you on the Red Button and on the BBC Sport website. Liverpool manager Jurgen Klopp: "We had chances but we didn't score goals, I saw a good game from my side. We had big fight, a lot of good team tactical things, nice enjoyable performances. But the result is not what you want. Does Christian Benteke need one to go in? "I don't believe in the easy goal. He has to carry on like this. It's not the nicest moment in his career but he has to work hard. He wants to score and we need him to score. We will work on it in the days, weeks and months." Slaven Bilic seemed emotional during that interview. He really wants to win the FA Cup, you get the sense of it! And why not? West Ham manager Slaven Bilic: "I can explain my feelings, and I can't at the same time. It is great, for me a really great game of football. It was a classic FA Cup tie. It will go into the history of West Ham's greatest games. Liverpool, last season at Upton Park, night kick-off, goal in the last minute. And we deserved it, I am very proud of the guys. They left their heart on the pitch. "The goal came as the cherry on the pie of his [Angelo Ogbonna] game. He was magnificent as a centre-half. They made the fans proud of them and we want to progress even further. If we produce a performance like this then we are capable of beating any team in England." Liverpool manager Jurgen Klopp, speaking to BT Sport: "It’s hard. We were the better team, created chances and played good football, but we didn’t use them. "There were lots of decisions that on a better day I’d say were funny decisions. I don’t think it was a free-kick [the decision that led to the winning goal] but I’d have to see it again. "It’s not easy because we were only here to win. You don’t have to show your best, you just have to go to the next round. The door was wide open for us because we did well but it was not enough. We have to carry on and fight to the next game." West Ham captain Mark Noble: "I was thinking 'where am I going to stick my penalty?' and then Angelo saved us all from the heartache of penalties. That was a strong Liverpool team there. Tonight we matched them." A fine header, you'll surely agree. Angelo Ogbonna thunders West Ham into round five. What a game - and well worth watching this one again, or catching up if you missed it. At 23:20 GMT (that's just under an hour), we'll have a 20-minute highlights show for you on the Red Button and on the BBC Sport website. Upton Park is empty now as the groundsmen tend to the weathered surface. Can West Ham go all the way in the FA Cup this year? It's Blackburn v West Ham in round five then, on Sunday 21 February. For Liverpool, that's now a weekend off, with the League Cup final a week later. You just know that if England play Belgium in the latter stages of Euro 2016 Benteke will suddenly morph into an unstoppable force of nature. Luke: We all wanted penalties. The only reason anybody was staying up. Ruined! Ash: You lot and your big mouths going on about penalties. You're jinxes you know. "This has been a classic FA Cup game, it really has. It's another set-piece that Liverpool have conceded from." That's it! 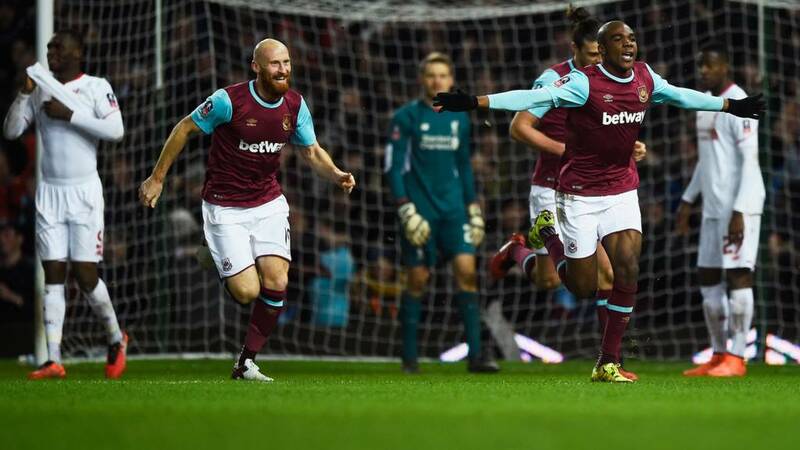 A cracker of an FA Cup replay and Upton Park may see another Cup game after all. Upton Park ERUPTS! Brilliant noise greets a wonderful header as West Ham surely book a place in the last 16!. Dimitri Payet's free-kick delivery from wide on the right is superb, centre-back Angelo Ogbonna climbs and batters a header across goal and in.